Just a quick message to wish everyone a fantastic Merry Christmas and Happy New Year. I will be taking a few weeks off writing and will return in 2008 for more New Zambia discussions. The early part of 2008 will be spent on holiday, including relaxing in Zambia for a while :) I wish everyone a safe and prosperous break. In keeping with previous years my Xmas will be a mixture of quiet contemplation and increasing my food intake! I encourage you to do the same!! For the New Zambia 2007 Awards , we shall follow the fantastic categories provided by one of my favorite television programmes - The McLaughlin Group. Being a big fan of the screaming exchanges between Tony Blankey and Pat Buchanan, its only right I should pay homage by adopting their much celebrated categories of the yearly "McLaughlin Awards" (now celebrating a 26-year run, given out each December). Iran - After having the specter of war hanging over them for the last two years, the Iranians not only managed to humiliate the likes of Great Britain over the "sailors", but also found themselves strangely vindicated by no other than the USA Intelligent Estimate. Joseph Mulyata - The Southern Province Minister found out that kneeling for President Mwanawasa was not enough to prevent ACC bringing corruption charges, which has now got him kneeling in jail as he awaits the trial. Barack Obama (USA Democratic Presidential Candidate) - within 11 months, the young American senator has climbed from a no-hoper to a potential President. Chrispin Musosha (Luapula Province Minister) who was reported by The Post to have beat up PF cadres who booed him during the Chingola bye-election, and thereby becoming the new face of "political hooliganism". To his credit, Mr Musosha has still kept his job. The defeat of the MMD candidate (and PF defector) Charles Chimumbwa to PF's Wylbur Simuusa in Chingola was unique. For the first time in Zambia we had a scenario where the electorate helped enforce party discipline. The next MP contemplating to switch sides will think much longer before he/she choses to defect. The fight against corruption as led by the Task Force. Just about the most boring work in the nation. It has been going on forever but has actually achieved very little. The "latest achievement" has been the pardon of Katumbi. Edith Nawakwi's poor attempt to shift the blame on the IMF / World Bank, when asked why she signed such poor mineral agreements on behalf of the Zambian people. The IMF / World Bank can be blamed for many things but not forcing you to be incompetent. The hardhitting Undermining Zambia Report that claimed large mining companies were selling Zambia short whilst generating huge profits from the country’s finite natural resource. The pressure from the report was intolerable for KCM who were forced to respond. Jointly shared between Jacob Zuma (new ANC President) and David Cameron (UK Conservative Party leader). The former managed to do the impossible by beating a seating President. The latter managed, with a single speech, to engineer an incredible bounce back in the polls like we have never seen before. Ron Paul (USA Republican Presidential Candidate) who has grasped the powers of the internet and runway away it. Yes he wont win the Republican nomination, but his ability to raise money online has been phenomenal! Robert Mugabe (Zimbabwe's President), who has kept to the same line since I can remember "its not my fault, blame the British". Its gotta be George Mpombo who continued the culture of kneeling! The National Constitution Conference. Zambians have had enough. Enough of the talking with no results and enough waste of money!While many of our people live on less than $1 a day, NCC delegates are being payed a staggering $350 per day over the one year life of the NCC. The international media led by the Guardian and Times Online who predicted Zimbabwe's collapse by December. As I write Zimbabwean leaders are now locked in fruitful talks to resolve the situation. The economy is still in tatters but the anarchy predicted by the international media and certain "experts" has not materialised. Celtel Zambia. The growth of Celtel which has been discussed at length this year has been nothing short of extraordinary. Long may it continue! General Petreaus (USA General) for doing the impossible in Iraq. Petreaus has actually managed to bring order out of chaos. Reports from Iraq still show that it is not yet an oasis of peace, but since Petreaus took charge the situation has radically improved. Zambia Chamber of Commerce and Industry (ZACCI) chief executive officer Justine Chisulo urging Finance Minister Ng’andu Magande to convert the huge debt the government owes parastatals into dividends for the treasury. Mr Magande had earlier challenged government parastatals such as Zesco, Zamtel and Zambia State Insurance Corporation to declare dividends to the government. It appears Magande forgot that government inability to pay back its debt that has kept most of these companies from moving forward. Indeed this has been Zamtel's perfect excuse for its poor performance. The ANC’s left wing allies within the loose tripartite alliance have long been calling for an abandonment of the market-friendly path to development currently in place in South Africa. Even the Zuma camp has insisted that this will not happen, that there is no question of ‘payback’ to the SACP and COSATU (who have no formal voting rights themselves) for their recent electoral success.......There is of course little suggestion that a shift towards more populist policies would accelerate the process of development. Assumptions to the contrary are deeply flawed, and reflect little understanding of the global nature of the factors that influence South Africa’s policy decisions. Through its hard-won reputation for fiscal and monetary conservatism, South Africa has in recent years managed to reduce the costs associated with its effort to redress the economic inequities of apartheid. Successive credit rating upgrades since its transition to democratic rule have allowed it to borrow more cheaply on international markets. The success of its economic policies to date, all resting on its hard-won reputation for policy conservatism, has allowed for a situation where the government is now able to accelerate social and infrastructure spending, contributing to a large current account deficit (8.1% of GDP in Q3), that is nonetheless easily financed by international capital inflows. Consider the costs to the country if this faith in policy were shaken. Worth checking out the new ANSA - Africa network, jointly created by the World Bank and the Human Sciences Research Council (HSRC) of South Africa, to become a leading African advocate of citizen involvement in demand-side governance initiatives. A lot of fascinating information e.g. 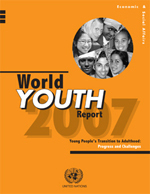 the 2007 Global Accountability Report . You can also check out links to similar websites. A majority of youth in Africa today have completed more years of schooling than their parents did but have limited opportunities in employment and remain poor, according to the The World Youth Report 2007. It is estimated, for example, that over 90 per cent of the young people in Nigeria and Zambia live on less than US$ 2 per day, and the same is true for almost 40 million youth in Ethiopia and Nigeria. These high levels of poverty persist despite poverty reduction strategies and some improvement in economic growth in the region. This suggests that recent policies adopted to revitalize the economy in Africa are not having much of an impact on youth poverty. Searchers are Zambians who are making a difference on the ground, and are not waiting for the Government to act. By this definition, 16 year old girl Thandiwe Chama of Lusaka's Chawama township, must count as our latest searcher for winning the 2007 International Children's Peace Price beating 28 other nominees from across the world. The Children's Peace Price is an initiative from KidsRights, an organisation advocating Children's Rights and providing individual support. When she was eight years old, her school was closed down because there were no teachers left. She refused to accept this and took the lead in walking to find another school, demanding her right for education and bringing with her the 60 other children of her school. After that, she has worked with government officials to provide for new school buildings. Taking action on behalf of children with HIV/Aids and calling upon others to do their share is one of her great drives in daily life. She gets the community involved to provide fruits to sick children in the nearby hospital. She advises children and parents on testing for HIV, and has even taken children herself to do the test. With a friend, she wrote and illustrated a booklet called “The Chicken with Aids”, telling young children about the perils of Aids. The NCC delegates are entitled to a sitting allowance of K500,000 persitting and subsistence allowance of K650,000 per day. They are also entitled to transport allowance of K100,000 per day and transport refund of K300,000 for those who reside outside Lusaka. Chief Government Spokesperson, Mike Mulongoti, has defended the allowances for NCC delegates saying the Government wanted the participants to find suitable accommodation, transport and other logistics during the conference......Speaking on a live ZNBC radio programme, Mr Mulongoti said in Lusaka yesterday the allowances for NCC members could seem huge but Government did not want them to languish during their deliberations because the conference was a national event. He said that if Zambians felt that the allowances were too high, they should lobby the delegates to declare them as such instead of that coming from non- participants. Mr Mulongoti said the Government, in fact, lamented on the cost of enacting the Constitution but the same people now condemning the allowances said it was expensive to come up with the Constitution and that the Government had to bear the cost. He said the Government had so far done its part but it should not be blamed for answering the calls of the people on the matter. “NCC is not going to give Zambians a constitution, it is going to give President Mwanawasa a constitution. It is very unfortunate that those MPs, who have decided to go there, are just going there for their pockets, not for the people. They have been hooked by Mwanawasa......It is very disgraceful that they have accepted to attend NCC just for their pockets. They should have gone there out of their patriotism and be there free of charge......This is the worst plunder of national resources by the Mwanawasa government. I fully agree with Michael Sata to expel his MPs who have gone to the NCC". Some say that a new constitution is priceless - should Zambians be willing to pay any amount to achieve it? Is it unpatriotic for NCC delegates to accept the allowances or should they do it for free? Are we likely to get a better constitution when people are paid to sit on the NCC or simply a more costly (and probably worse) outcome? And what about the PF, should it expell its MPs who plan to attend the NCC, apparently for financial reasons? In case you have missed the news - The Post is now running "opinion polls" via SMS. I applaud the Post for attempting to gauge public opinion on various issues, but unfortunately the method chosen (SMS) is likely to lead to "self selection bias". Its my view that The Post's chosen method is most likely to elicit responses from those that feel negatively by government - or are seeking some form of change. I mean seriously, how many people would spend time and money to say something positive about any government? Zambia Association of Manufacturers (ZAM) president Dev Babbar calling for greater technological transfer between foreign investors and local manufacturers. "Celpay’s banking platform has afforded previously un-banked small and medium scale enterprises (SMEs) access to banking services. Its product offerings such as the electronic airtime distribution suite, business-to-business payments, bill payments module are adding great value to corporates and their customers by affording them security, convenience and real time payments solutions.....we can safely say that mobile banking is here to stay and will continue to grow significantly, faster than online banking, as has been the trend globally.......In the next five years, the mobile banking end-game will not be about checking balances and paying bills. It will evolve into a mobile wallet and the youth of today enjoy the benefits of hassle free technologies that allow greater convenience and for us, that means looking at more innovative ways to do things......Blue chip companies are also set to benefit as the vision for the next five years has a multi-pronged mobile banking strategy, featuring potential new solutions for banking services for small to medium enterprises as well as international money transfer." Good analytical websites focused on Zambia are few and far between. Perhaps a testament to the bankruptcy of Zambian ideas. If Zambia is develop, we need more research organisations (and think tanks) which are focused on embedding rigorous analytical approaches to underpin policy development and decision making. Among this rare breed are two key websites which are certainly worth checking out. First, Zambia Food Security Research Project which has many interesting working papers, policy briefs and powepoints from all the applied policy analysis and outreach work they do with different Zambian organisations. For example, you can check out their most recent policy brief on Security of Widow's Access to Land in the Era of HIV/AIDS: Panel Survey Evidence from Zambia . The paper on Fertilizer Promotion in Zambia: Learning from Regional Experience, and Strategies to Raise Smallholder Productivity is also quite interesting. Another important website is the FANRPAN Zambia , which publishes some fascinating papers from researchers and civil society. For example, you can check out the recently uploaded "New Agriculture" and Implications for information development and diffusion: Perspectives from Zambia. Particularly fascinating are the two reports on HIV/AIDs and agriculture - Impact of HIV/AIDS-related deaths on rural farm households' welfare in Zambia: implications for poverty reduction strategies; and 2007 Zambia Human Development Report: Enhancing household capacity to respond to HIV and AIDS. If you know of other important Zambian websites in the same vein, do let me know so that we can add them to the New Zambia rotation. Mwansa said Zambia in future would export energy derived from uranium to neighbouring countries, but he gave no further details. Cabinet Size - Mulongoti Versus Everyone? "It’s also about balancing to make sure that those tribes who feel marginalised are also catered for. They must feel that they are part and parcel of the country’s decision making....The decision cannot be made by an individual. It has to be made by the appointing authority because the Constitution of Zambia gives powers to the President to create and abolish offices". Does our system of governance deliver a more representative government at all levels? Is the cabinet unnecessary bloated, and therefore ineffective? I think Mulongoti is addressing question (1), but taking the current system of governance as given. I think there is some merit in what he is saying - when your system of governance is top down and with a very weak local government and limited participation from those who bear its brunt, then you have to ensure you reflect social differences at the cabinet level. Where I think Mr Mulongoti has missed point is that he has failed to look past the current system and dream of better and more coherent system of government, where people feel more represented at the local level with real powers to make change. National tribal balancing only becomes important if people (or as Nonde calls them "the masses") don't feel they are being heard in policy making. Surely the best way to do is to devolve more power to the local level? A starting point should be what I call A cultural approach to Zambia's development. Mulongoti's opponents, have focused entirely on question (2). In a resource constrained nation, it is right to push for more efficient system of government. However, I think in focusing only on (1) they have missed the opportunity to address the broader question of how we can have both representative democracy, greater local scrutiny and with a smaller cabinet. Incidentally, they are also guilty of Sakism (the thinking advanced by certain politicians that just because others are doing it, we should also do the same thing. Other people's actions are the best reasons for your own actions). Senegal's action are useful in pointing us to what is happening in other places but do not provide a cogent reason for our own actions. Mulongoti's opponents have not clearly demonstrated how similar Zambia is to Senegal and whether the current composition of cabinet is indeed bloated. I have not seen a single paper from civil society /political parties/ Zambian think tanks that demonstrates the resource savings that can be made without affecting existing operational objectives. The full Civil Society position on the Draft Land Policy is now available online. You can access it here (18 pages). We discussed a brief version of their position here. Although electrification in general has the potential to shift rural areas to a new labor market equilibrium through changes in labor demand, I argue and present evidence that household electrification more plausibly operates as a labor saving shock to home production technology which can in turn release female time into the market. My results indicate that in areas treated with electrification projects, the proportion of households using electric lighting rises significantly and the proportion of households cooking with wood falls significantly...Instrumental variable results suggest that female employment rises by a significant 13.5 percentage points (lower bound of 5 percentage points, upper bound of 45 percentage points) in treated areas, while the change in the male employment rate is not statistically significantly different from zero. These positive, significant changes for women are notable, since over the same period national unemployment rates are rising. Livingstone town clerk George Kalenga warning against employing relatives in the local authority, in a letter to all heads of departments at the council. In some respect, nepotism is probably worse than corruption because it tends to combine misallocation of resources with discrimination against capable individuals, in favour of less compent family or tribal relations. Unfortunately, its ‘quiet’ nature also makes it much more challenging to tackle. There has been much discussion lately on the state of corruption in Zambia. The Public Accounts Committee chaired by Charles Mulipi was the first to draw the blood with accusation that billions of Kwachas had been lost from corrupt civil servants. In recent weeks and months we have witnessed the relevant heads of the Drug Enforcement Commission (DEC) and the Anti-Corruption Commission (ACC) come under fire for supposedly corrupt / criminal activities. Last week, the Former President FTJ Chiluba, himself facing corruption charges, has been quoted as saying that perhaps corruption is more rampant in the current government than in previous administrations. In the first part of the "Corruption Wars" series, I argued that the “first best” approach to dealing with corruption was to treat it as part of a broader debate on moving forward as a nation. It is germane to development, but perhaps much more important are broader areas like institutional reform, improvement in local financial markets, and most importantly improved infrastructure that supports agricultural, educational, mining and tourism policies. But with so many cases of corruption being highlighted left right and centre, just where should this "institutional" fight against corruption begin? Thinking back over the last few years, what do you regard as the most corrupt Zambian department that we should urgently seek to reform? Most of the respondents suggested the Ministry of Education! A number mentioned Ministry of Lands, and a few suggested Home Affairs (some specifically mentioning the Police) with Health registering some high numbers as well. I was amazed by the variety of the answers, but also challenged on just how a government faced with limited resources should decide where to concentrate the fight against corruption. Economic intuition would certainly suggest that while corruption may have some detrimental effects on growth (an issue for debate in its own right), its likely that the severity of impacts would vary by the type of corruption. Given the limited resources available to government, the challenge should be to focus on those areas of corruption which may be more harmful in terms of growth and equity. There are at least three possible areas where I think corruption may have serious effects, and therefore should warrant more government focus compared to other areas, all things being equal. First, corruption is likely to be more detrimental where it is likely to disproportionately affect the poor compared to the rich, leading to larger income inequalities over time. The question is whether some form of corruption possibly leads to poor people paying more bribes as a proportion of their incomes compared to the rich. Literature evidence on this is few and far between, but some studies have shown that in several African countries, the poor generally pay more bribes than the rich. This would suggest that, faced with limited resources, our fight against corruption is perhaps better focused on tackling rural based corruption e.g. corruption in local institutions where the poor are likely to be hit hardest. Second, corruption is likely to be most harmful where it “hits people twice”. Some authors have suggested that there are instances where people pay bribes in connection with misfortune or adverse events they experience, with the consequence that the expense and possible disutility of bribery compound the original problem. The central point is that misfortune or adverse events can lead an individual or household to bribe simply by increasing their need for public service. For example, victims of crime will want to report the crime to the police, an act that may require a bribe to ensure police cooperation. Or if you are sick, you may be compelled to use the public hospital, which could involve a bribe to jump the queue! Its difficult to know which problems are most likely to lead to bribery, and hence hit people twice. The magnitude of the effect would depend not only on the severity of the problem, but also on the degree of the institution to which victims would have recourse. The challenge for government is to identify these areas and focus the fight there, since that is where more damage to individuals might occur. For example, the assessment might suggest that police and health authorities should be the focus of any fight against corruption. Third and finally, corruption is likely to be more damaging to society where it affects those institutions that are there to prevent it. Corruption in institutions which are tasked with combating corruption is likely to encourage corruptions in other areas, since the possibility of detection is reduced. For this reason, many people have emphasised that any fight against corruption must begin with eradicating corruption in the police force and the various watchdog organisations. In many ways the current problems facing DEC and ACC are more likely to damage the fight against corruption than any corruption taking place in education or elsewhere. Criminal activity in watchdog organisations could send the wrong signal to other areas of society. Part of the current problem in Zambia is that watchdog institutions fall under the Ministry of Home Affairs. To really improve the way these organisations function new legislation is needed that gives these organisations true independence and the appointments of relevant heads to occur through open competition, coupled with appropriate independence that allows them to investigate, arrest, and prosecute without reference to any other authority. In a nation with limited resources, our fight against corruption must provide value for money. This requires a much clear understanding of which areas are most harmful for growth and equity. Measures which help to tackle rural based corruption, reduce corruption that “hits people twice” and repair institutions that are at the forefront of fighting corruption are likely to be more effective and less costly compared to wide and expensive efforts against corruption. Update (8th December 2007) - I have finally got round to watching Sorious Samura's much advertised Living with Corruption on CNN International, it had already been shown on Channel 4 in the UK as part of Dispatches - under the title How to get ahead in Africa in October 2007. The real life documentary provides a vivid potrayal of ways in which corruption "hits the poor twice". It shows how the very poor in Kenya (and much of Africa) are squeezed to their last coin by petty officials who line up to extort from those who have literally nothing to even get by. I strong urge you to see Samura's latest offering if you have not done so already. Reuters report that Celtel is now on course to achieve its 2007 target of 2m users, and projects that its subscriber base will reach 2.7m in 2008. To top it all, it now plans to offer 20% of its shares on LSE. The question of who is empowering Zambians between Celtel and Zamtel, has never had a much clearer answer. The irony of course is that its Zamtel's incredible inefficiency in the sector that is actually fuelling Celtel's market dominance. I have previously argued that faced with a weak regulator (Communication Authority of Zambia), this may well be bad news for the future. Two or three years down the line Celtel may possess a lot of market power which are best anticipated now and handled with a giving CAZ more powers to regulate tariffs through the pending ICT bill, liberalisation of the international gateway and necessary break up of Zamtel in two as we have argued here. Finance and National Planning Minister, Ng'andu Magande said in Lusaka yesterday that the team had almost completed its work and appealed to Zambians to be patient despite the long time the process had taken. Mr Magande told a Press briefing that the mandate for the re-negotiation team was extended to cater for the establishment of an optimal fiscal and regulatory regime for the mining sector. Emphasising that the team was wholly composed of Zambian top civil servants, Mr Magande said from its findings on the renegotiation, it became imperative to re-look at the entire tax regime for the sector. Mr Magande said the planned optimal fiscal and regulatory regime when implemented might render the current and future development agreements irrelevant. He said it was important that the mining companies contributed more to Government to fulfil the stated purpose of development agreement on the need to secure maximum benefits for the local people. Because of the concessions given to the mining investors in 2000, their tax contribution now did not correspond with their revenues following the soaring metal prices on the international market, hence Government's decision to re-negotiate the agreements. Update (7th December 2007) - The Minewatch blog has some interesting comments on this interesting development. Our signatories to the mines privatisation agreements were guilty of a serious oversight. Today we all recognise this and would like to correct it. But we must take great care lest, in attempting this, we commit an even greater and more costly oversight. Let me explain. Many voices are urging that we cancel the agreements. Yes, we could do that, and the foreign investors who bought the mines would have no effective way to prevent it. If they fought us we could win. But it would be a pyrrhic victory, a battle won leading to a war lost. For economic development depends on much more than natural resources, money and technical skills. Far more important are certain intangible factors, such as trust, the rule of law, respect for property rights, and a reputation for dependability. Some people may argue that Africa does not yet have the trust of other peoples, so there is little or nothing to lose. But I believe that view is profoundly mistaken. Trust is something one has to win, and today Zambia has a great opportunity to win it. How? By honouring signed agreements, instead of taking the attitude that the end justifies the means and tearing them up. If we keep our word, varied by whatever changes can be agreed in friendly negotiation, we shall add immeasurably to Zambia's reputation as a dependable partner in development. But to keep our word will require courage. Far easier to give in to current popular demand and forget about Zambia's international standing. That, however, would be an oversight which our children and our grandchildren could bitterly regret. BOZ Governor Caleb Fundanga is a big fan of Paul Collier's Bottom Billion, and believes that the book provides a good example of where Zambian economic research should be heading. I have read the book, and whilst there's much good in it, I do not think it is aimed at an African audience. Its very much aimed at G7 countries, those than can effect change at an international level e.g. Collier recommends G7 military intervention to prevent collapse of failing states or the creation of international charters on good practice on dealing with precious resources like copper. These are important issues, but not subjects that should worry Zambian researchers, as we seek to find innovative ways of tackling the pressing challenges. But, I was wondering, what are some of the books you have read, that you think Zambian researchers / policy makers of tomorrow should be reading? Now what must Zambia do in response to Anglo's decision to pull out of KCM?.....Officials have rightly underlined that we have to find a mining company to take Anglo's place. The general public and firstly all our decision makers, have to understand that Zambia cannot begin to afford to create and run a state controlled mining company without huge external assistance. We do not have either the credit or the freedom of action to borrow vast sums on the international markets as we did when Kenneth Kaunda took over the mines....and here is a further word of serious warning. Many of us (though not Kasonde) are in danger of misreading the lips of the World Bank. However effusive and enthusiastic senior officers of the Bank may have been to us in recent weeks, the word is out : No concession finance. Let us be well aware : neither the Bank nor any others of our foreign friends can or will under any circumstances subsidise a new ZCCM. Just one of the many fascinating comments from Theo Bull's articles published at the time of Anglo's pull-out from KCM, and the limited options that were available to Zambia. You can access the articles here. My thanks to Murray Sanderson for making these available. The move towards a clear framework is certainly welcome, but I remain unconvinced by Dr Kalombo's utterances, for three reasons. First, the policy is focused on "new investments". What about existing investments? Have we given up? Secondly, government may be studying the matter, but it is certainly not "consulting widely". The Mines Ministry website has yet to take shape, so just where is he consulting widely? No one has seen the Draft Mining Policy, let alone the proposed "revised Mines and Minerals Act". All we have heard is that it will become law in December 2007, along with it, provisions on uranium and oil exploration. As usual, policy will become law quietly without full discussion among all Zambians. Finally, I hope Dr Kalombo realises that the "world average" is certainly not the 3% that was proposed in the 2007 Budget, and subsquently enacted in Parliament, earlier this year.